Pure Michigan campaign ads had persuaded trolls—residents of Michigan’s lower peninsula, like me—to crawl out from our homes south of the Mackinac Bridge. It was Labor Day weekend, the last chance for many families to head up north before the start of a new school year. For my family, this was the perfect time to explore the beauty of our grand state’s upper peninsula. Our adventure began in the city of St. Ignace at the area’s number one, Trip Advisor rated, hotel: the Best Western Harbour Pointe Lakefront. 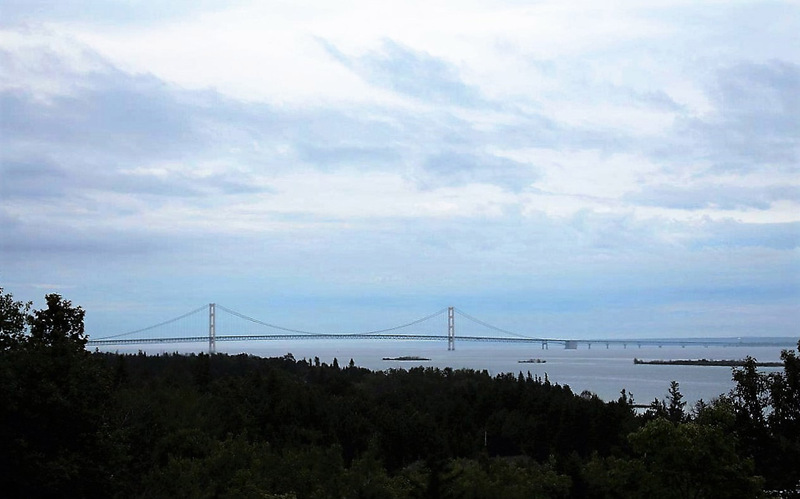 Nicknamed Mighty Mac, the Mackinac Bridge is the longest suspension bridge in the western hemisphere and fifth longest in the world. After dinner, my husband, four children, and I sat around a bonfire with other hotel guests. I asked Zach, who was part of the hospitality staff, if he knew any ghost stories. He was busy unloading wood for the fire but sat down for a few minutes to share some of the rumors he was familiar with. I light-heartedly listened to Zach’s fanciful stories. What I didn’t know at that time was just how much this discussion would affect my psyche and influence my decisions throughout the rest of the trip. Zach recalled the tale of a woman who had an extramarital affair. Townspeople killed the unfaithful wife by dunking her repeatedly underwater in what is known as the drowning pool, a twenty-feet deep, seaweed-infested lagoon on nearby Mackinac Island. The ghost of the woman reportedly now haunts that area. Intrigued by this story, I later looked online for more information. I read through pages and pages of creepy hauntings that had frightened local residents and visitors, but I couldn’t find the exact story Zach had referred to. I discovered one other, however, that best fit his account. Haunts of Mackinac author Todd Clements described the unfortunate outcome for seven prostitutes who were accused of being witches. The ladies were subjected to a test in order to determine their innocence or guilt. A large boulder was tied to each lady. Then they were thrown into the drowning pool. If the women floated, they would have been found guilty—considered witches—and subjected to further punishment: death by hanging. Since every one of the accused actually sunk deep below the surface of the water, they were vindicated of sorcery but had drowned in the process of proving their innocence. The women now make appearances as eerie, shadow-like figures floating above the lagoon or as huge, larger-than-life splashes on the surface of the water. The unique history of Mackinac Island may support that claim. Indian chiefs were buried there; soldiers died there. Other people committed suicide and murder. Death is nothing abnormal, of course, but it does produce an odd result on Mackinac. The island is considered to be one of the most haunted places in Michigan. 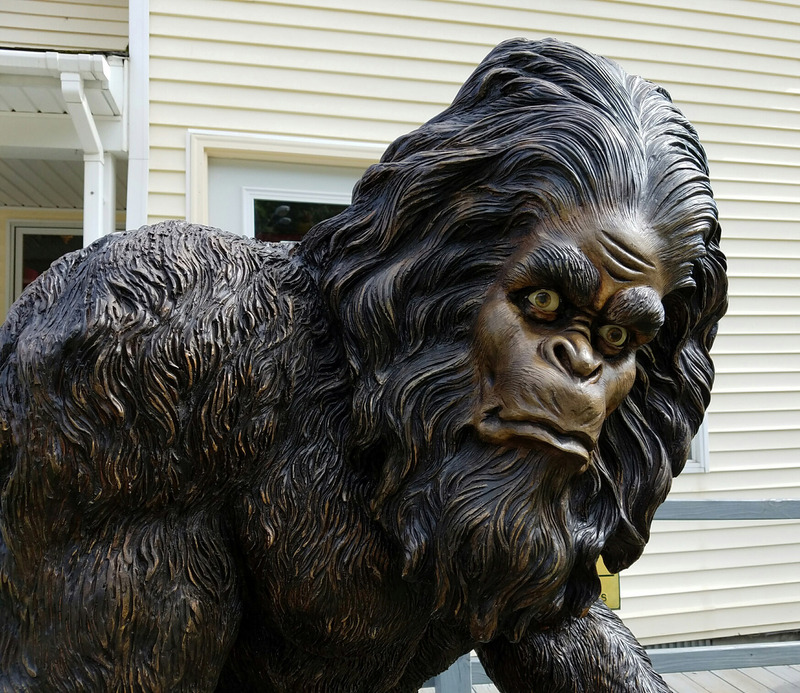 This Bigfoot sighting occurred right in front of Muldoons’ restaurant and gift shop in Munising. I suppose Zach has never seen a ghost, and so he finds it easy to dismiss the paranormal. But how do reasonable people like him react to legends of animal-like creatures such as Bigfoot? Zach is probably a skeptic. He joked about having seen a similar phenomenon, the Dogman. It’s described as a large dog that walks upright on two legs and terrorizes the northern part of Michigan. Because Zach had laughed, I knew he didn’t want me to think that he truly believed in the werewolf-like animal. But people in our remote towns are seeing mysterious things they can’t easily explain away. Documented reports are so convincing that I admit this: As my family and I hiked through the U.P. wilderness, I was on guard against two specific entities besides ferocious cougars, man-eating black bear, and venomous Massasauga rattlesnakes. I looked deeply into the thicket of the forest and wondered just what I would do if I crossed paths with the gruesome Dogman or the iconic Bigfoot. 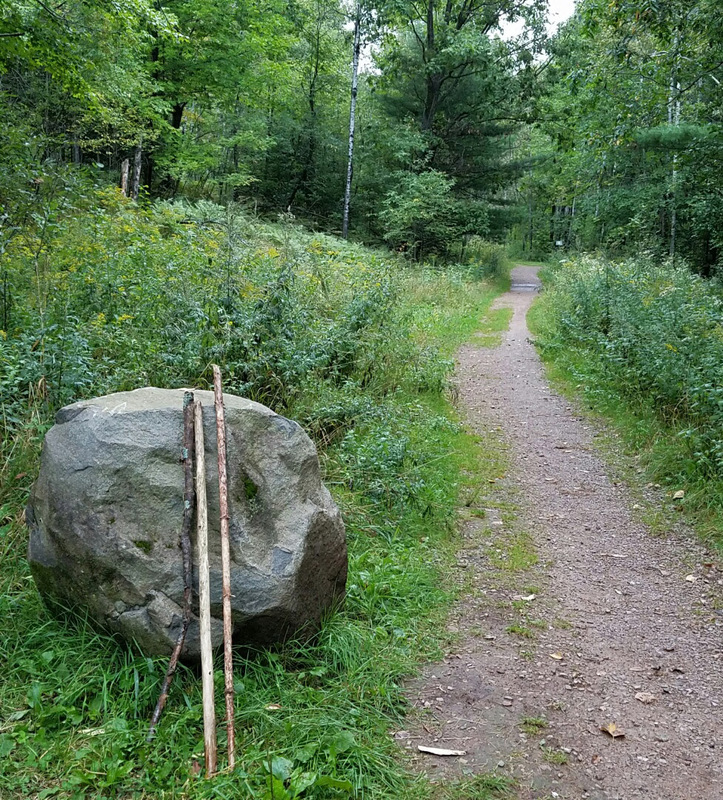 Preparation for our hike included selection of the right-sized walking stick. Luckily, we found these at the trailhead. I stayed on the trail best I could and kept searching for anything out of the ordinary. I quickly dismissed non-threatening deer tracks. I counted the number of toes in common dog prints and made sure to find four paw prints in stride with one another. I listened for evidence that my family and I were being studied and stalked. Were our feet the only ones to be thudding upon the ground? Why were the birds in the trees suddenly taking flight? In one hand, I tightly gripped the three-foot long walking stick I had selected at the beginning of our hike. I used the stick to brush the tall grasses that lay ahead of me, hoping to roust camouflaged critters. Occasionally I practiced twisting the knobby branch up and out in front, like a jousting pole or a sabre. The fingers of my other hand delicately wound around another item that empowered me with confidence. I reasoned that I wouldn’t use it unless the risk to my family was too great not to. Could I actually do it? I wondered and considered alternative scenarios. I knew that I might very well be faced with no other choice. I was convinced at that point. Determined. If the worst should happen and a feral beast were to get too close, I would swiftly raise my arm, take aim, and throw my treasured, tasty, chicken pasty at the creature. No Yooper would let that staple go to waste. By the time he finished it, my family and I would be long gone and safely out of the woods. I enjoyed reading your story. I agree that the chicken pasty would certainly be something to distract an angry predator. i never knew that about the Grand Hotel. enjoyed the article. Thanks for letting me know that you enjoyed the article. There’s so much to see and experience in Michigan. I hope you have opportunities to explore the state. Thank you for letting me know. I was hoping for smiles with this one. The boys are going to take after their daddy, an iron man. There’s nothing to worry about. We’ll have fun. Thanks, Ana. As always, I enjoyed the story. This was certainly a different way to see the UP!! Kelly, great photos combined with a tale of family fun and Michigan lore. Enjoyed it.